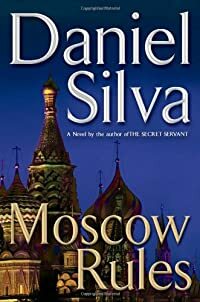 Moscow Rules by Daniel Silva, a Mysterious Review. Review: Daniel Silva's eighth novel of espionage and international intrigue, Moscow Rules, has Gabriel Allon summoned by Israeli intelligence from his holiday in Umbria to Moscow to look into the death of Aleksandr Lubin, a Russian independent journalist and the bane of the new Russia's existence. Lubin was on a mission to expose the offenses of Ivan Kharkov, the son of a senior KGB officer and boy wonder of KGB's Fifth Chief Doctorate. When the Soviet Union began to crumble, Kharkov amassed a fortune in banking, investing heavily in energy, raw materials and real estate. He became one of the newly minted billionaires of the new Kremlin. His holdings included shipping and air freight with branches reaching across the Middle East, Africa and Asia. Lubin was investigating the rumor that Kharkov was amassing dangerous arms to sell to al-Qaeda in order that they could continue their assaults on the United States and their allies. Allon, as a member of Israel's foreign intelligence service, brings together and manages a group of spies and counter spies, negotiators and mediators, and must travel around the world in order to stop the sale of the arms to al-Qaeda. Time is quickly running out. Although the primary plot of Moscow Rules is a tremendously absorbing account of the potential of global war, the interesting subplots within the story are also worthy of mention, most notably the loving and amusing marriage of Gabriel and Chiara Allon that is in marked contrast to the volatile marriage of Ivan and Elena Kharkov. There are also the deep rooted and entertaining friendships between Allon and members of the "Office" (Israeli intelligence). The fusion of the critical threats of terrorism with the relative normalcy of the personal lives of the agents is remarkably well done and the intricate scheme that Allon conceives to foil the arms sale encourages the reader to keep turning the pages. Special thanks to guest reviewer Betty of The Betz Review for contributing her review of Moscow Rules. Acknowledgment: FSB Associates provided a copy of Moscow Rules for this review.